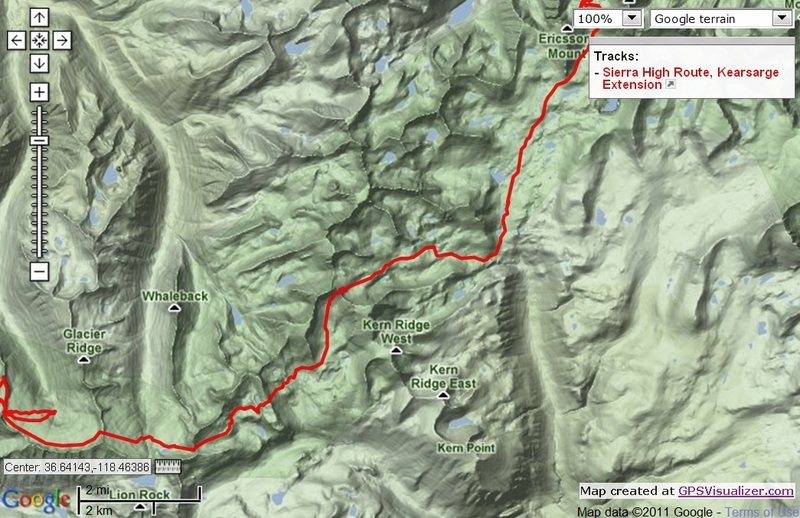 Sierra High Route – Days 3 and 4 | Meghan Kelly Teles! We woke up after a windy night of sleeping on rocks and tried to wait it out for the sun to reach our breakfast spot. I estimated 20 minutes, which was about an hour off, but it got people out of the tents – if only to hike to the sunny spot and have breakfast there. Mornings were pretty cold. Here is James with a rock frozen to his sock. We had to descend and knew it wouldn’t be soft, but the south face was actually pretty good and it was nice to start off the day with a few turns. This was where we made a small mistake. We looked at Harrison pass and it looks steep and icy and while we couldn’t see Ericsson pass, we had a photo and to us it looked more inviting – at least from afar. 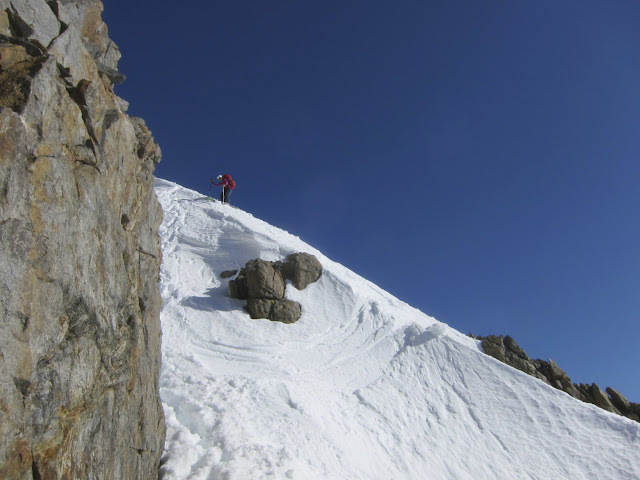 When we approached Ericsson pass, we realized there was a colossal cornice that would probably be difficult to get around, so we lost some valuable time and back tracked to Harrison – which, of course, wasn’t as steep as it looked head on. 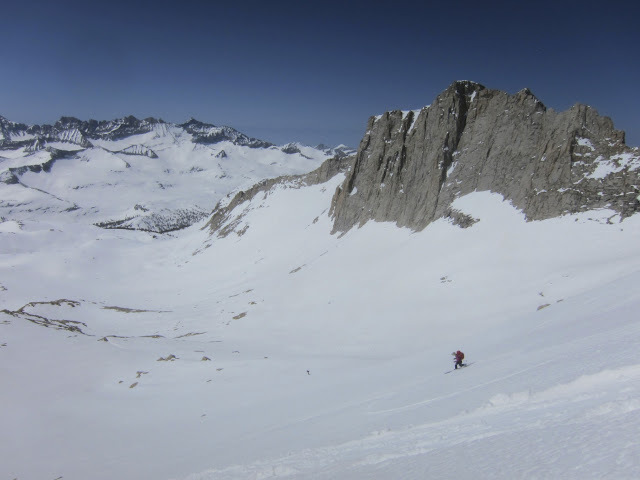 James and I started skinning up Harrison, while David opted to boot since he didn’t have ski crampons. Just like Deerhorn the day before, we found a mixture of consolidated and unconsolidated snow and in the warming sun, this translated to tremendous skin glop – so we booted the rest… and it actually was steep. 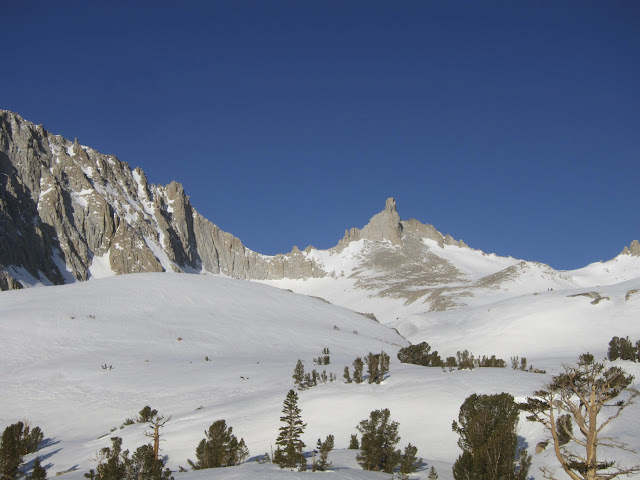 At the top of Harrison we were treated to views of Tyndall and even a sliver of Whitney – we were about to descend gradually for miles and meet up with the tradition Sierra High Route. We descended to the mouth of the Kern River Canyon and saw the 1st skin track we’ve seen since Kersearge. We switched over to skins and started the long, but gradual climb up to Milestone – one of the highest passes of the trip. Our original goal was to make it over Milestone, but the sun was hot and we opted for a nice camp on the East side of Milestone with lots of views and no one else around. With the fresh skin tracks, we knew it wouldn’t be long before we saw actual people and so it was nice to have one more night of camping with no one else around. Complete with a view of our next objective giving us the finger – Milestone Pass. Or maybe a thumbs up? We needed the rest because we had plans for a super ambitious day 4. We woke up and got out of camp a little after 8am – our earliest departure so far. The plan was to climb 5 passes today – Milestone, “Not as Steep as it Looks,” Triple Divide, Copper Mine, and No Name or “Teleshorts” pass. So we started the climb up Milestone. Cool view of the Black Kaweahs right before we ran into the first people we’d see on this trip. 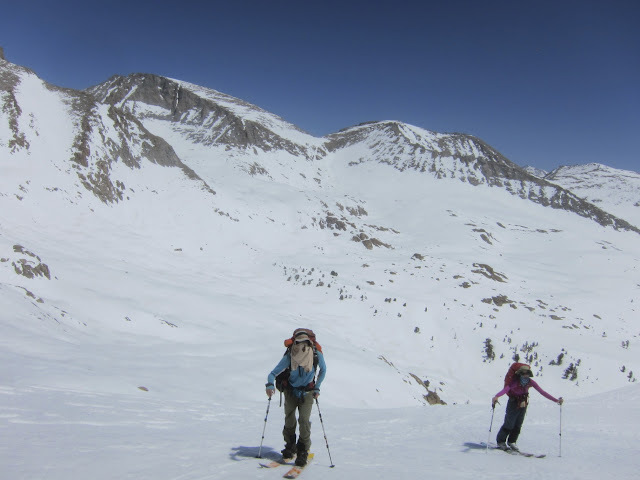 That crew was a guided group from ASI and Geoff Clarke – telemark instructor extraordinaire – was their guide. It was nice to see a familiar face out there! 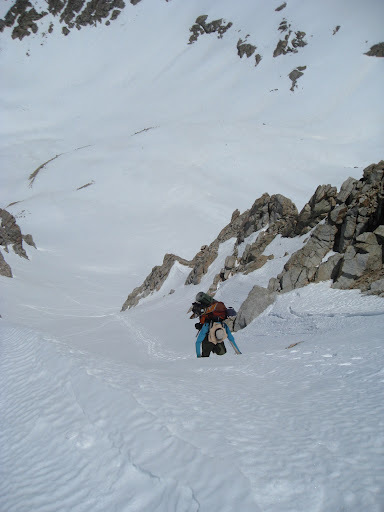 Then it was a long contour down to the base of Triple Divide to don skins again and climb up to Triple Divide Pass – which was surprising easy. And obviously super beautiful. It helped that we got to do a fair amount of fun descending. The last big pass was Copper Mine and we were all feeling super strong. We powered up it awed by the scenery in the adjacent Cloud Canyon. Happy to be at the top of pass #4! 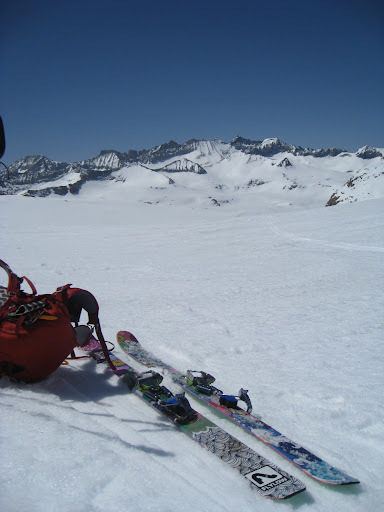 Copper Mine pass is usually a downclimb, but this year it was skiable. With a full pack I was a little apprehensive. But once the crux was navigated, it was fun jump turns and a long contour around Deadman’s canyon. Deadmans was unreal! At the top of our final pass, we ran into some folks from Tahoe who we knew! It was the 3rd group we saw that day after not seeing anyone for 3 days. I guess that is what happened when you cover some serious ground on the traditional route! Then it was just a fun decent down to a large flat rock we had eyed from the top of the pass as a good camp. What a day! Map from days 3 and 4.